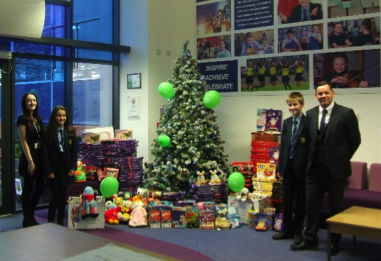 Poynton High School has joined forces with Reed Accountancy of Manchester in their campaign to donate as many Christmas selection boxes as possible to The Royal Manchester Children’s hospital. Reed Accountancy had hoped to collect 150 to 200 boxes but with an amazing response from students and staff Poynton High School has amassed over 500 selection boxes. Following a twitter appeal asking for support from local businesses, Armcon and Senior Aerospace BWT have also boosted the collection. In addition to the selection boxes over 100 toys and gifts for those children who cannot eat chocolate at the hospital have been donated. The photo shows Abigail Johnson, Beatrice Oldham, Benjamin Lees and Mark Fox.